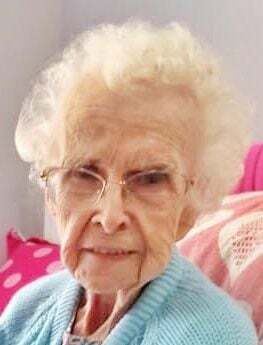 MATTOON — Catherine “Cathy” Gwinn, age 92, of Mattoon passed away at 9:20 p.m. on Saturday, April 13, 2019 at the Odd Fellow-Rebekah Home Harmony Center. Funeral Services honoring her life will begin at 11:00 a.m. on Tuesday, April 16, 2019 at Schilling Funeral Home. Burial will take place at Zion Hill Cemetery. Visitation for family and friends will be held from 10:00 a.m. until the time of the service on Tuesday at the funeral home. Cathy was born on May 29, 1926 in Mattoon the daughter of Ward and Leah (Spitler) Deckard. She married Ted Gwinn Jr. on November 2, 1946. He preceded her in death on October 14, 2002. Survivors include her children, Linda (Rob) Perry, Jim (Cheryl) Gwinn, Jerry Gwinn and Lisa (Stan) Owens; grandchildren, Sherrie (Chris) Miller, Nathan (Tami) Perry, Dustin Perry and Travis Owens; three great-grandchildren; and numerous nieces and nephews. In addition to her husband, Cathy was preceded in death by her parents; son, Larry Gwinn; sister, Libby Parkinson; granddaughter, Rachel Owens; daughter-in-law, Andrea Gwinn; and canine companion, Sammie. Cathy enjoyed spending time outdoors in her yard and working in her flower garden. She loved to crochet, solve crossword puzzles and watch her favorite TV show, “Murder She Wrote.” Cathy will be remembered as a people person who cherished spending time with her family and friends.